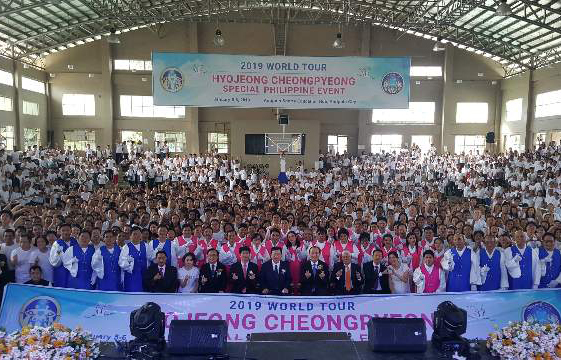 With 2,300 people attending from January 5 to 6, the Hyojeong Cheongpyeong Special Philippines Event was held at the Ynares Stadium in Antipolo City in the Philippines. Starting at 9:00 am on the first day, there was an introduction to chanyang through a video screening so that the many participants could attend the chanyang session and understand the proper meaning of chanyang. The lecture was given by Dr. Chung-sik Yong (Regional Group Chairman of Heavenly Asia Pacific). His lecture gave the participants profound realizations that enabled them to be forever indebted and grateful to receive through him, a blessing from True Parents. Rev. In-cheon Kim (President of Heavenly Asia Branch Training Center), gave a lecture in English entitled, “The Grace of Cheongpyeong Works and Our Responsibility.” Through the lecture he explained the process of developing the Cheongpyeong Providence and what the blessed families should do for the providence in the era of True Parents’ direct dominion. Rev. Edgar Tanate also gave a lecture on the importance of the Ancestor Liberation and Blessing Ceremonies. On the second day, chanyang, ancestor liberation, the Spirit World and Physical World Matching Workshop, the Hyojeong Offering Ceremony, and the Ancestor Blessing Ceremony and Spirit World and Physical World Blessing Ceremonies were held. Many participants were spiritually reborn and restarted their lives as they liberated and blessed their ancestors. The bequeathing of the Candle for Seonghwa Second Generation and an explanation to start a Spirit World Physical World Family were also held. Lastly a celebration party was held to finalize the event amid loud cheers and applause from the participants. It was an informative and historic day in which the substantial Holy Spirit could move at the Hyojeong Cheongpyeong Special Philippines Event in Manila. We would like to introduce some of the testimonies of the participants who experienced grace.